All valid authorized dealer and registered supplier are informed that sealed rate and quotation for purchasing of equipment for U.G.C Sponsored programme of entry into services ,Remedial coaching and net-set coaching are invited from date 27/01/2014 to 31/01/2014 at remedial coaching center at H.D.JAIN.COLLEGE ,ARA ,office in working hours. copy of rules and regulation may be obtain from the office ,Director/Principal of U.G.C sponsored programme, H.D.JAIN.COLLEGE ,ARA. Principal/Director reserves the right to cancel or to distribute tender among one or more tender, principal/director decision will be last in any matter. All valid and registered supplier and dealer are here by informed that H.D.JAIN.COLLEGE,ARA ,Is inviting rate for purchasing of books for all departments from 2 Feb 14 up till 10 feb 14 in working hour at principal office (accounts section) .mandatory to Give 10 % library discount on books, order may be given to agency offering highest discount above mandatory 10% lib discount. Principal H.D.JAIN.COLLEGE ARA reserves the right to cancel any order or any process at any stage without giving any reasons .In any matter decision of Principal will be last. All valid and registered agencies are informed that the following work at H.D.JAIN.COLLEGE, ARA, campus are to be done through outsourcing agencies. Wishing agencies may give quotations within two days ( 09-12-2013 to 10-12-2013 ) of publication of this advertisement in news paper & college website in working hour. Details may be obtained from principal office (accounts section). 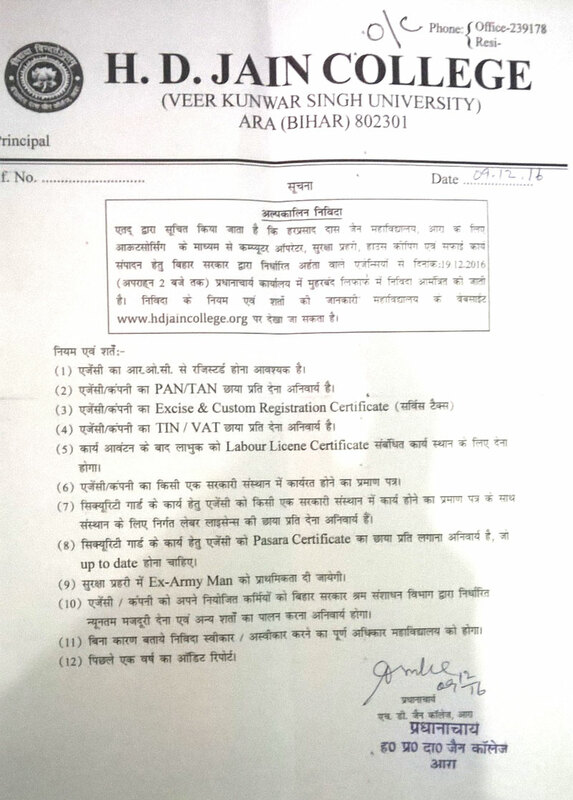 Work will be allotted after receiving approval and grant from higher education govt of bihar patna. Sealed Tender are invited from registered and Valid Suppliers for procurement of equipments at H.D.Jain College,Ara ( Details can be obtained from principal Office, Accounts Section from date 20/01/2013 to 02/02/2013) for the Department and Library. Note: Principal of H.D.Jain College,Ara, reserves rights to cancel the tender without specifying any reasons. Sealed Tenders are invited from Valid Contractors and Agencies for the repairing work at H.D.JAIN COLLEGE,ARA. Details can be Obtained from Principal Office ( Accounts Section ) in office working Hour from 22/01/2013 TO 02/02/2013. PRINCIPAL H.D. JAIN COLLEGE ARA RESERVES THE RIGHT TO CANCEL ANY TENDER WITHOUT SPECIFYING ANY REASONS . 4. Registration of Proper Class and Value. 6. Character Certificate by District Magistrate or Supridentent of Police Bhojpur. Rs 2 Lac Only ( Two Lac Only ). Only ( Two Lac Only ). 2. Rules and Guidance by Bihar Government will be followed. will be disqualified for Tendering process. ALL REGISTERED AND QUALIFIED AGENCY ARE INFORMED THAT TENDER QUOTATION ARE INVITED FOR THE WORK OF SOFTWARE FOR ONLINE ADMISSION OF INTERMEDIATE AND GRADUATION PART 1 IN WORKING HOUR AT COLLEGE OFFICE FROM FOUR DAYS OF PUBLICATION OF THIS TENDER . DEATAILS CAN BE OBTAINED FROM JAIN COLLEGE OFFICE.